In 2011 the Baby Boomer generation started reaching retirement age. Which means senior living communities are starting to serve the wealthiest, healthiest, and most demanding generation yet. As I explain in my presentation How to Meet the Demanding Dining Needs of Boomers, the newest generation of retirees are typically interested in a wider range of food choices than previous generations were, and they lean toward choices that are healthy for the body and planet alike. 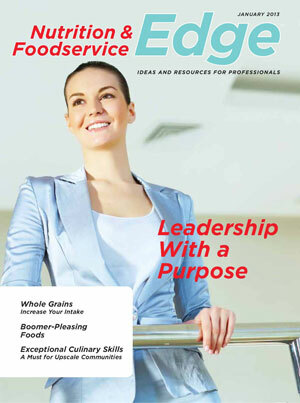 The following list of resources will help you stay abreast of Boomer trends and meet their dining expectations. Keep an eye on the issues that are important to Boomers today and what is becoming important in order to meet their expectations. Vegan choices, especially, are an excellent way to satisfy a large cross-section of diners seeking alternatives. In addition to vegetarians and vegans, people who are lactose-intolerant, watching their cholesterol, observing religious dietary restrictions, and/or environmentally conscious appreciate vegan dishes. 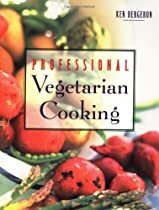 Plus, many ethnic and trending health foods are vegan or vegetarian, so, with thoughtful planning, you can cover a wide spectrum of Boomer dining desires with your vegan/vegetarian menu section. The easiest way to upgrade your menu is to upgrade your ingredients. The easiest way to satisfy Earth-friendly Boomers is to implement food grown locally, humanely and organically. Your local farmers can help you meet both these goals at once. Men are a significant part of our population, but too often we neglect their preferences. When planning your dining program, remember men eat differently than women. The Baby Boomer generation is starting to retire, which means more and more are looking at senior living communities. Even the youngest Boomers are shopping for senior housing—for their parents. This is a demographic shift we can’t afford to ignore when it’s time to plan the menu. Are you seeing more Boomers touring your community with an eye toward the best situation for their mom and dad? 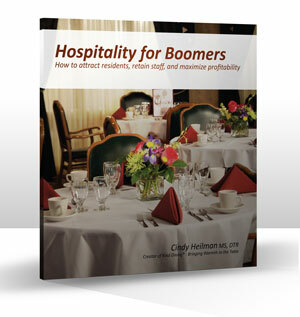 Create an organization that provides the exceptional service and genuine hospitality Boomers’ expect in the dining room. Because this is where you can truly positively impact your bottom line. If your service makes Boomers choose your community over the competition, you’ll have the competitive edge in your marketplace. How do you do that? Kind Dining® Training. 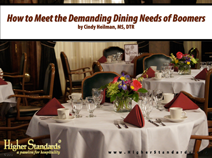 Your staff wasn’t born knowing how to serve meals properly and hospitably, but they can learn. You can teach them to be your biggest company asset and turn your dining room into a marketing magnet for Baby Boomers.